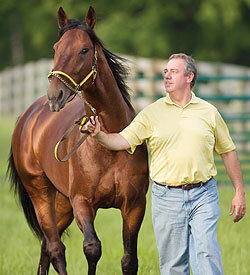 Where does Somebeachsomewhere rank among the best standardbreds to ever look through a bridle? A berth in the Canadian Horse Racing Hall of Fame a mere nine months after he finished his racing career speaks volumes. Fittingly, it was Brent MacGrath who perfectly placed Somebeachsomewhere among the pacer’s peers and in harness racing history. The Ontario-bred son of Mach Three out of Wheres The Beach retired to a lucrative stallion deal at the famed Hanover Shoe Farms with a nearly-perfect record of 20 wins in 21 starts. His lone loss (to Art Official) was an epic second-place performance in the $1 million Meadowlands Pace that only furthered his legacy. The Beach compiled over $3.2 million in just those 21 well-picked races, for gaudy earnings of $156,655 per start. No wonder the $2,448,003 Somebeachsomewhere compiled in 2008 during his three-year-old campaign was a new record for single-season earnings. Along the way, he set four world records, including the fastest mile in the history of the sport (1:46.4) and recorded sub-1:50 miles in exactly half of his 20 wins. He was the unanimous choice as Canada’s horse of the year in 2008 and shared the honour in 2007 – as a two-year-old – with sophomore pacer Tell All. The Beach’s back story is nearly as compelling as the horse itself – a dreamer’s tale. MacGrath, a car salesman from Truro, NS, cobbled together five partners to buy an Ontario-bred, picked out one yearling in October of 2006 on his first trip to Lexington, KY and was able to purchase the horse at exactly his limit. “I didn’t have $40,100. I had $40,000. I said, “If he goes for $40,000, I own him,” MacGrath said. On Oct. 4, 2006 at the Lexington Selected Yearling Sale, the hammer fell on hip number 268 at exactly $40,000. MacGrath then defied conventional wisdom by training the colt in Truro. Teamed with his old friend, driver Paul MacDonell, the two Macs meticulously planned every step of Somebeachsomewhere’s career. By the end of Somebeachsomewhere’s perfect (six-for-six) freshman season, the mainstream media came to court The Beach. In 2008, Somebeachsomewhere was one of the biggest news and sports stories of the year in Canada. He was considered for the Lou Marsh Award honouring the nation’s athlete of the year. He was featured on CBC’s The National news program and he was named the Newsmaker of the Year for Nova Scotia by the CBC. He was profiled in the nation’s biggest newspapers and on national radio. His Facebook page topped 1,600 members. He and his connections made the cover of industry trade publications 18 times. In November of 2017, it was announced that ‘Beach’ had a small cancerous mass – a large cell lymphoma – removed and had begun a six-week round of chemotherapy. The Somebeachsomewhere Syndicate announced that he had been humanely euthanized at Mid-Atlantic Veterinary Center in Ringoes, New Jersey on Sunday, January 14, 2018 and that Somebeachsomewhere would be laid to rest at Hanover Shoe Farms in Hanover, Pennsylvania. In short, Somebeachsomewhere was the horse of a lifetime.